For children and adults dealing with bladder and/or bowel loss, going for a swim may seem like something to avoid. We strive to provide a full range of solutions for anyone dealing with incontinence. 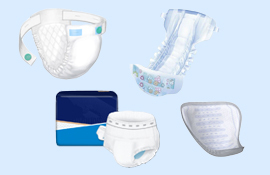 There are many incontinence product types available on the market today. Incontinence pads, guards, and liners are inserts that secure to undergarments with an adhesive strip. They offer less bulky protection and are easy to remove and replace when soiled. Once you understand what type of incontinence you have we can help you determine the best products to help you manage your incontinence. Many women who have been treated for breast cancer have had surgery, like a lumpectomy, modified or simple mastectomy, or radical mastectomy. A breast prosthesis or breast form is an artificial breast that is used after a woman’s breast has been surgically altered or removed. These forms come in a variety of materials (usually silicone, foam, or fiberfill) and can be worn inside a bra or attached to the body with a special adhesive. There are advantages to having a breast prosthesis. Bedside commodes, known by a host of other names including commode chair, toilet chair or portable commode, are an important bedroom addition for many patients. As the name implies, bedside commodes are commonly placed at the bedside to be used as a portable toilet by patients who have difficulty getting to the bathroom on their own or with enough time. 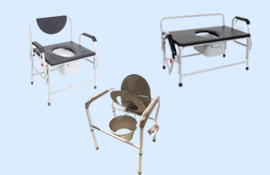 Portable commodes come in many different styles, to suit various needs. All-in-one commodes are very useful because some individuals may have a hard time getting to the bathroom during the night.For patients with limited mobility, a commode with drop arms is important to make transferring on and off the commode easier. Alternating Pressure Mattresses are designed to be used by bed ridden patients who have lost the ability to move in bed, change their resting position or with lowered mental awareness level. 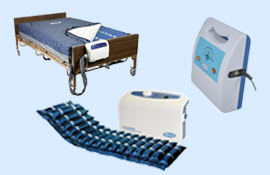 Alternating Pressure Mattresses consist of individual air tubes that automatically inflate and deflate on a set schedule which changes the pressures on a given point on the body, enhancing tissue perfusion by increasing blood flow through capillaries as pressure is applied and released. Alternating Pressure Mattresses greatly lower the risk of pressure sores or bed sores. Alternating Pressure Mattresses can prevent or help heal decubitus ulcers, commonly called 'bedsores' or 'pressure sores' and provide comfort to patients with burns, Multiple Sclerosis, Lou Gehrig's disease, Fibromyalgia, etc.